We did it again! Thanks to Sue Anna making the arrangements, The Tollway Tatters met at the Hinsdale Oasis for a day of tatting, chatting, sharing, and eating. Can you tell we had a great time? Sue Anna got to take the picture, because she has the longest arms. That's Sue Anna in the front. 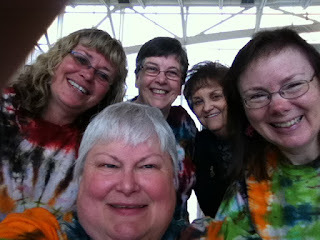 Clockwise from Sue Anna... my friend Denise, me, Barbara, and Marilee. We celebrated International Tatting Day one day early. Although after our discussion regarding Leap Year, maybe we met right on time! Membership has its benefits, or so they say! In this case, I believe it's true! I am a fairly active member of The Tatting Forums, and Chris Hinton has designed a new shuttle especially for members. Lucky me... I am one of the first to receive one of these little beauties! The top side says "The Tatting Forums, Est. 2010." The bottom side has my name and my member number. I LOVE it! It's made out of cherry, and it can be ordered with or without a pic tip. I didn't think I was going to like this color, but it surprised me! I think it's gorgeous! The shuttle is from an exchange with Lily two or three years ago. I love the purples and blues with the touch of bling near the tip. Shuttle exchanges are so much fun! that I limit myself to one project at a time! I couldn't help myself. I went looking for something... I've forgotten what... I saw the thread holder, shuttle, hanky, and thread all within a few inches of each other, and I knew I just had to start another project! I purchased the hanky at a discount store when I was visiting Mom in Alabama a while back. The thread holder and shuttle were decorated by me during my Mod Podge binge last year. The thread is size 80 Lizbeth #165, Grape Splash. The pattern is Baby Lace from Tatting with Visual Patterns by Mary Konior. I sure am enjoying working with the fine threads! The next shuttle in my collection is Vineyard from LaCossette. I LOVE this shuttle! Normally, I don't care for purple, but I knew this shuttle had to be mine from the moment I saw it. As I took it from its place in the display case, I saw that the bobbin was fully loaded, but what was the thread on there? I've looked through my Handy Hands thread chart, and none of the colors seem to be the right one. So, unless one of you can help identify this pretty colorway, it will remain a mystery thread! I thought about what you said about the thread sometimes getting imbedded on the bobbin, making it hard to unwind. I would guess maybe that's when the bobbin is a bit tight and you have to pull a bit harder on the thread to make it unwind and that forces it in between the layers of thread below. Might that be it? In that case, you just have to be a bit more careful to help the bobbin along rather than just pull the thread out. It has happened to me on a rare occasion, but I know what you mean. I paid close attention as I was tatting, and I think she's right... and, I think that uneven winding of the bobbin contributes to the problem. I may try using the bobbin winder on my sewing machine to load the next bobbin. That way the tension and the winding would be more even. I'll be sure to let you know if that helps! I do like the way this thread looks tatted up! I was reading the information on the color chart that I picked up at The Original Sewing and Quilting Expo, and I learned that the color changes in this thread occur every 2 1/2 - 5". I haven't looked closely to see if the changes are truly random as the information indicates, but I do like the flow! The shuttle is Blue Diamond from LaCossette. Isn't it pretty? I am finding that these shuttles work best for me when I'm using size 40 thread... is that normal? I wonder if the thread binds up on the bobbin because of the way I'm winding it. Does anyone have any insight? I do love the light weight of these shuttles, and the crochet hook in the end makes joining a breeze! By the way, I've made the offer before, but everyone may not have seen it. If there are any of these Sulky Blendables threads that you would like to try, please let me know. Send me an email with your mailing information and the colors that appeal to you, and I will be happy to send samples of thread. The 30 wt. Sulky has 500 yards per spool. That's a lot of thread, and I'm pretty sure I won't have time to tat it all! This thread definitely looks like Autumn to me! The shuttle is one of my favorites from LaCossette. Funny, I never was able to get the hang of using a bobbin shuttle until I tried one of LaCossette's. I'm not sure if I was used to closing rings by pulling on the shuttle instead of the thread, or if I had some other problem, but now I do love these shuttles! This adorable shuttle is from a shuttle exchange with Tattabugg a few years ago. Every time I use this shuttle I think about the patience it took to apply these leaves and flowers so perfectly, especially since the pattern is on both sides. I've tried attaching stickers and cutouts... not for me! I do much better with tissue, scrapbooking paper, and fabric. I'm also no good at painting. I'm glad I know so many talented people who are willing to exchange with me so that I can have it all! Daughter Alison and I attended The Original Sewing and Quilting Expo today, trying to get some inspiration. It worked! First, we found the Sulky display, and I chose 12 beautiful new threads! This time I purchased 12 wt. The Sulky Blendables I've been working with is 30 wt. I'm really looking forward to tatting with these gorgeous threads! A couple of aisles over we found a display of King Tut threads. Of course I just had to have a few! I don't know if you can see the subtle color changes in the thread on your monitor. This thread reminds me of cream (not milk) when it's added to coffee... before it's stirred... when the coffee starts to slowly blend with the cream... mmm! The shuttle is the other in the set given to me by Bonnie. Isn't it pretty in pink? There was a question posed at The Tatting Forums regarding the Oval Doily from A New Twist on Tatting. Although I've owned this book for many, many years, I've never been inspired to tat anything from it. I did find the directions a bit confusing, but I did my best to interpret the pattern. 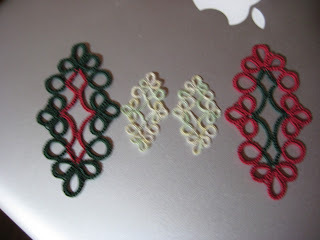 I found that tatting with two colors helped me keep track of what I was doing. This is size 20 Lizbeth, #670 and #685. I'm not sure if I'll continue or not. This is the first of nine rounds, so it's a pretty big undertaking. Have you tried this pattern? What's your experience with the directions? I love going in to my sewing room and looking at the beautiful lighted display case that Dave made for me Christmas 2010. This is most of my collection of blinged shuttles. I'm going through my shuttles row by row, and the next two shuttles were SewMates decorated by my friend Jenny. These shuttles were loaded with size 20 Lizbeth from a long discarded project. The shuttles seemed a little large for the Sulky Blendables thread, so I decided to tat Stumpy in the size 20. There's quite a difference in size when compared to the Sulky Blendables! I think if Chris decides to make a shuttle out of these, it will be the size of a Tatsy. Now I can get back to my Sulky Blendables! While waiting for loads of laundry today, I managed to tat two more Stumpy motifs, this time in Sulky Blendables #4002. You're looking at the top side of another shuttle decorated by my friend Jenny... very appropriate for a librarian! I love books, and they love me. I get them free at the library. Library books are oh so nice. See ya at the library! And now I have another set of shuttle-shaped motifs to send off to Chris Hinton at The Shuttle Shop to be shuttle-fied! I am really enjoying tatting with my Sulky Blendables thread collection! I haven't really done any research into this thread, but I'm assuming that because of its name, it is meant to be used with another thread as an accent. I've been tatting with a single strand, and yes, it is very fine. Honestly, I've been uninspired by some of the threads when looking at them on the spool. However, once I start tatting with them, they seem to come to life! For me, the Stumpy motif by Kersti Anear is the perfect way to try out all of the different colors. Each motif takes me about an hour to tat. I've been tatting two of each color to send to Chris Hinton at The Shuttle Shop to be made into Tatted Shuttles. I get the joy of tatting with a purpose, and Chris has motifs to practice with so that he can perfect his shuttles... win/win! No, I am not selling these motifs. I am just having fun helping out a very talented shuttle maker. If you are interested in ordering one of Chris's shuttles, all you have to do is go to The Tatting Forums and contact his wife Erin. She can provide you with information on shuttle styles and prices. Now that I've finished my samples of #4004, I'm really looking forward to trying another color! Yes, I do have TWO fish shuttles from my very talented friend Jenny. Aren't I a lucky girl? I love the color of this thread... it reminds me of a Dreamsicle! This is another shuttle decorated by my friend Jenny. I feel so lucky to have such talented friends! P.S. ~ the shuttle was decorated by my friend Jenny! A year or two ago, I purchased a plastic case loaded with Sulky Blendables thread at Overstock.com. Why Sulky Blendables? I had received a sample from Georgia Seitz, and I loved it! What I didn't realize when I ordered the thread, was that this is 30 wt. thread, not the 12 wt. that Georgia sent. Not knowing the difference, I tried it out. It was much later that I realized that I was using a much finer thread! I do enjoy tatting with it. I can untat chains, but I have been unsuccessful with opening rings. Stumpy is the perfect motif for me to use with this thread. It's small, and when I make a mistake, I don't mind cutting the thread and starting over. The size of these finished motifs is 1 1/4" x 3/4". As you can see, they're much smaller than a Clover shuttle! My friend Jenny decorated the shuttle for me. Isn't it adorable? You may have guessed... I'm tatting up a set of Stumpy motifs in the Sulky to send off to Chris Hinton at The Shuttle Shop. These will make adorable shuttles! I've been asked about how the Tatted Shuttles are for tatting. I love them! They hold a tremendous amount of thread. They're wider than any other shuttle I own. I really like the feel, but I don't think you can really go by me. I love every shuttle I own! I have now tried out all of the colors I have in Oliver Twists! I think this may be my favorite set of colors. Do I dare order other sets? We'll see! As before, these Stumpy motifs designed by Kersti Anear are destined to become Tatted Shuttles from Chris Hinton at The Shuttle Shop. First of all, it was a Monday holiday... thank you Casimir Pulaski! Secondly, the mail lady arrived with goodies! I love my new Tatted Shuttles from Chris Hinton at The Shuttle Shop! The shuttle on the left is AnneB's design, my tatting, and the center shuttle is Kersti Anear's Stumpy, my tatting. The shuttle on the right is Jane Eborall's tatting... lucky me! I also received two new shuttles and some HDT from LadyShuttleMaker. I can hardly wait to see if these are musical shuttles! In another package, there were these two adorable little dishes from Grizzly Mountain Arts. I just love Dave's and Jo's pieces... shuttles, spindles, jewelry, baskets, and lovely little dishes! after spending so much time tatting with quilting thread, size 30 felt like rope! Tatting Some "Curds and Whey"
I've been leaving bits of Oliver Twists thread on my shuttle as I've finished each Stumpy motif, and my shuttle was getting a little full! I decided to try "Curds and Whey" from Tatting with Visual Patterns by Mary Konior. As simple as this pattern is, I manage to make mistakes every time I try it.